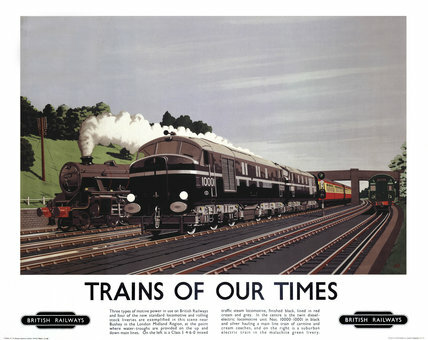 Poster produced for British Railways (BR), showing examples of the three types of motive power used by its locomotives. On the left is shown a Clas 5 4-6-0 mixed traffic steam locomotive, while in the centre of the picture is the twin diesel- electric locomotive unit nos 10000-10001, hauling a main line train. To the right is shown a suburban electric train. Artwork by V Welch.